Google knows more about you than your mother does. It may be that Google knows you better than you know yourself. For Google, it’s easy. They keep a record of everything you do through their services. From every search that you’ve ever entered, they’ve learned more about you, including your likes and interests as well as identifying the people to whom you are connected. Have you ever used Google for a job search or to learn more about a medical condition? How about searches for television shows, musicians and movies? Perhaps you’ve searched for a bank or brokerage house or found your Realtor by using Google. If so, then Google remembers it. Google maintains a user profile for everyone who uses their services. That’s pretty comprehensive, but the records don’t end there. Anyone who has a Google Account may have given the company a wealth of information like name, gender, birthday, phone number and password. If you make any comments on YouTube, upload photos or videos, write emails or add contacts, these things are all recorded too. It’s not as if Google ever purges that information. They’ve kept user profiles dating back as far as 2005. This means that every time you’ve used Google, a new entry has been made in your profile. That time in college when you were interested in recreational drugs? Google has a record of it. The reality is that these extensive records are a direct threat to your privacy. While you can erase the history in your browser, this does nothing to clean out your Google history. That’s because deleting your browser history only works on your own device. Chances are good that you’re concerned about your privacy and security in the online world. You want to use the best VPN to ensure that no one is able to keep a record of what you do online. However, if you don’t clear out your Google search history, you’re leaving yourself vulnerable. Even if this data does not get hacked or misused, it’s still an invasion of your privacy. Why is Google Keeping All of That Data? Google isn’t going to delete the information that they’ve gathered over the years. That’s because they rely on it for various purposes. One of the most concerning of these purposes is their participation in mass surveillance. Google closely works with government agencies to “spy” on people. 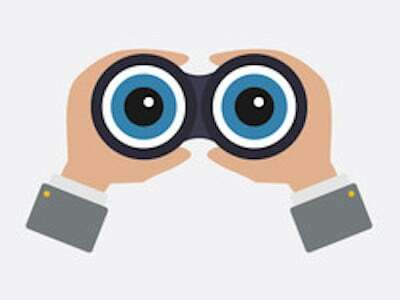 The PRISM surveillance program is of particular concern to security professionals. Under this program, the NSA in the U.S. is able to collect reams of online communications. Similar programs are active in other nations. Additionally, that data helps Google to target you with specific advertising. That winter coat that you looked at online? Suddenly, you can’t get away from it. An advertisement for it follows you everywhere you go. Google is quick to note that they don’t sell your data to third parties, but they’re still making a profit. That’s because advertisers pay them to place ads. Google is succeeding at this game in spades. They are dominant over all other online ad-placement services. 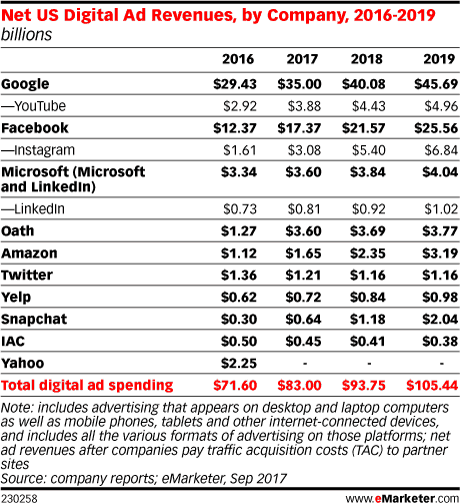 Google further is known for buying a staggering number of businesses. The data that they gather from you and others is needed to help these ventures succeed. Some of their most recent acquisitions include Sigmoid Labs, Workbench, Onward, Senosis, GraphicsFuzz, Cask, and many others. Do You Hate the Idea of Google Knowing So Much About You? There’s no question that Google is a great search engine. You get lots of excellent results in no time. However, that service comes with a price, namely, your privacy. As more people realize how invasive and widespread Google’s tactics are, the sense of urgency to erase their Google history grows. If you’re uncomfortable with the idea of any company having that much information on you, some of which likely dates back to 2005. There are steps that you can take to deal with it. 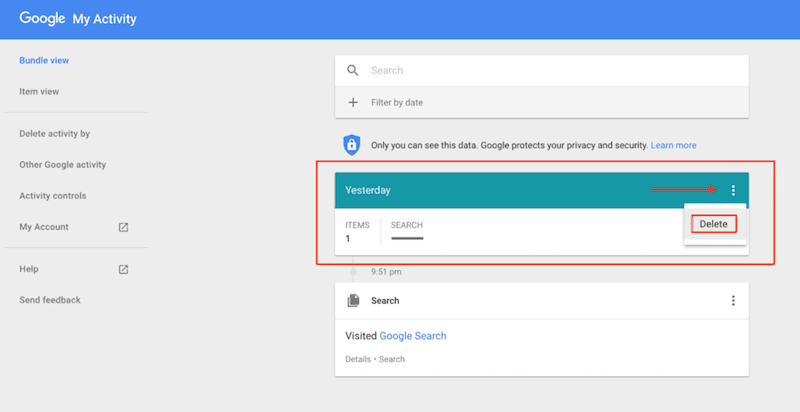 It seems counterintuitive, but the only reliable way to delete your Google history is through your Google account. Accordingly, if you don’t have a Google account, you’ll have to create one. If you’re like the vast majority of people, you already have one. If you don’t, thengive Google only the bare minimum of information about you. Begin at Google’s home page. Go to the upper right corner to log into your Google account if you’re not already logged in. Then, click on the circle-shaped icon with your initial. Google takes you to your Google Account home page. Select the “Data & Personalization” category on the left-hand side of the screen. Scroll down to find the “My Activity” button. Click on it, and Google may try to convince you that sharing your data, and keeping it in their records, is important. They use three slides that provide the reasons why they think you should be more open with your activity. These can essentially be ignored because the emphasis here is on protecting privacy. Is There Data You Want to Keep? Some of your searches may not be particularly sensitive, and you may not mind if the world knows about them. 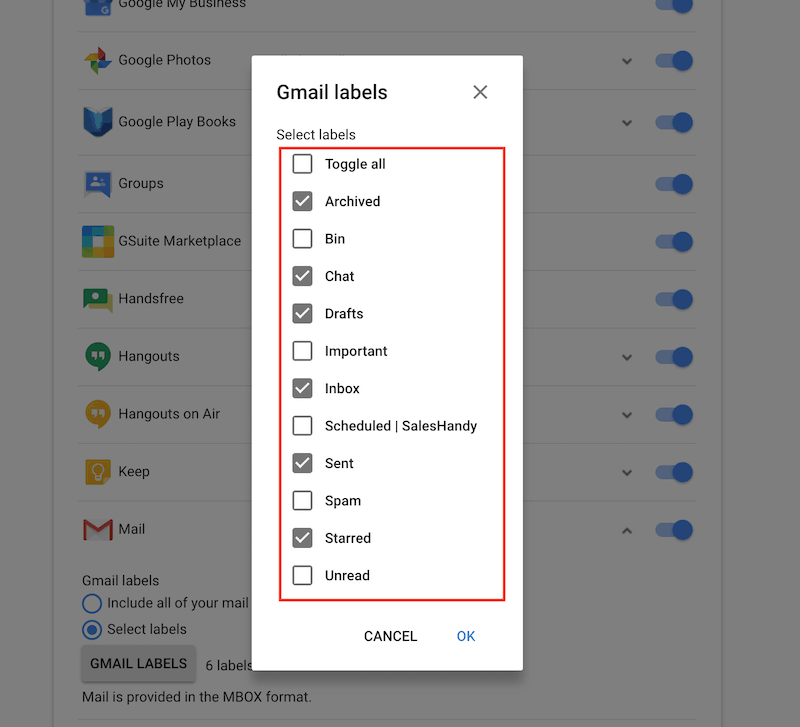 Deleting your Google history also includes getting rid of emails in your Gmail account. There also may be other things within your Google profile that you want to keep. If this is the case, then you will need to download the data before you delete anything. This is vital because the deletion process described here completely wipes out your Google history. You don’t want to lose any vital emails or other data that is still useful to you. To download selected files that you prefer to keep, log into your Google Account. Find the data takeout page. 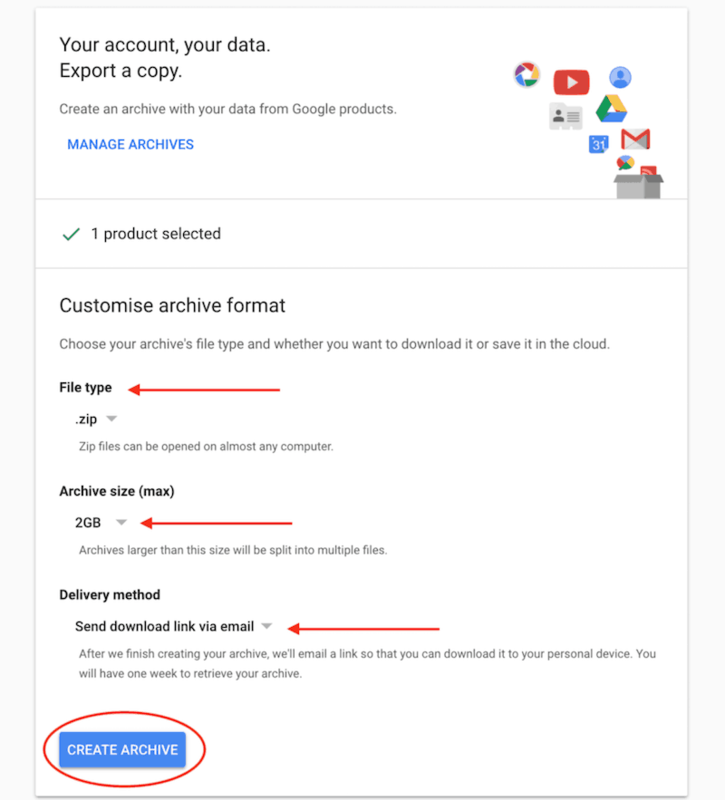 Google automatically selects all types of files within your account for download. Since you likely don’t need or want to download your entire Google history, you can click on “Select None” so that no categories are chosen. From here, you can pick and choose which files or file types that you want to download and keep. For instance, within the Gmail area, you might select all of the items in your inbox and your drafts. Once your selections are complete, click on “Next” at the bottom of the page. This brings up a new page where you can choose where to store your download. It’s also possible to choose whether you want a .zip or .tgz file type. Then, you must choose how your data will be delivered. Most people prefer to have a link emailed to them, but you might opt to have the link sent to your cloud storage. Next, you’ll click on “Create Archive” to begin the download process. Depending upon the size of the files you’re downloading, this can take several minutes. Once your email arrives from Google, click on the link to download your data. Consider keeping a copy on your PC and another in your cloud or on an external hard drive. Find the “Delete Activity by” button on the “My Activity” page. You can choose from a few options to decide what to delete and what to keep. You may delete based on specific topics or products. This is where Google starts to panic a bit. It gives you a card that tells you how your history makes Google faster and more useful. Click on “OK” to bypass this. Then, Google double-checks to make certain that you really want to delete that entry. 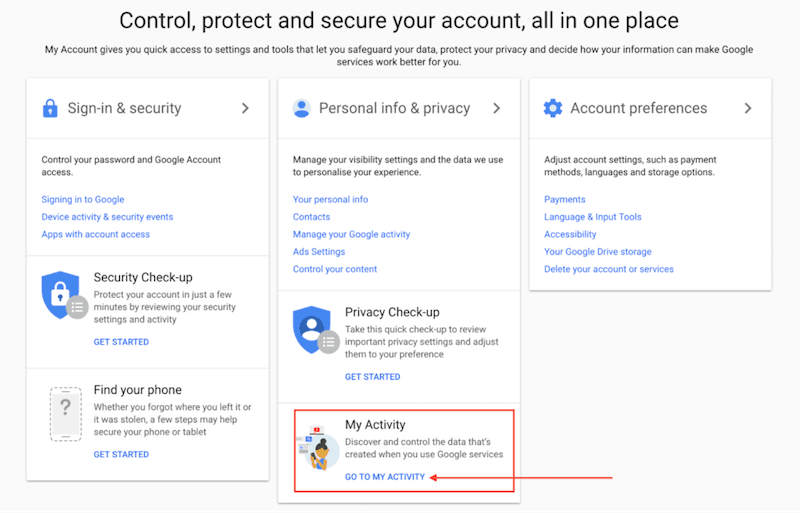 Helpfully, they let you know that similar data may still be attached to your Google Account in areas like Location History and Chrome History. 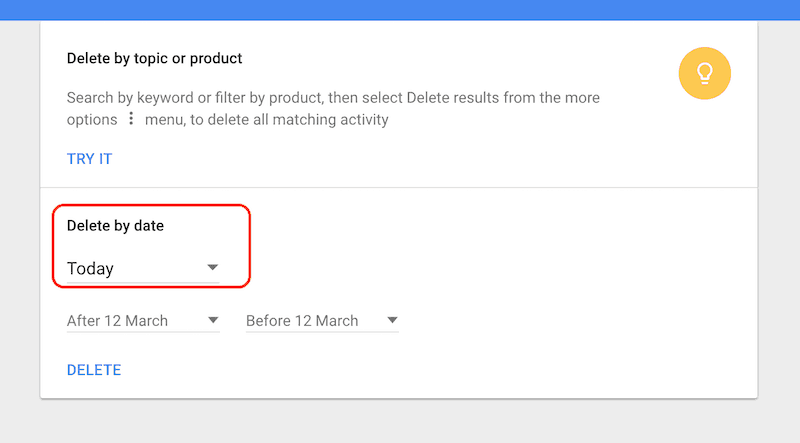 It also tells you that if you want to see this other activity, you can visit “Other Google activity.” Click on delete, and the selected entry disappears. 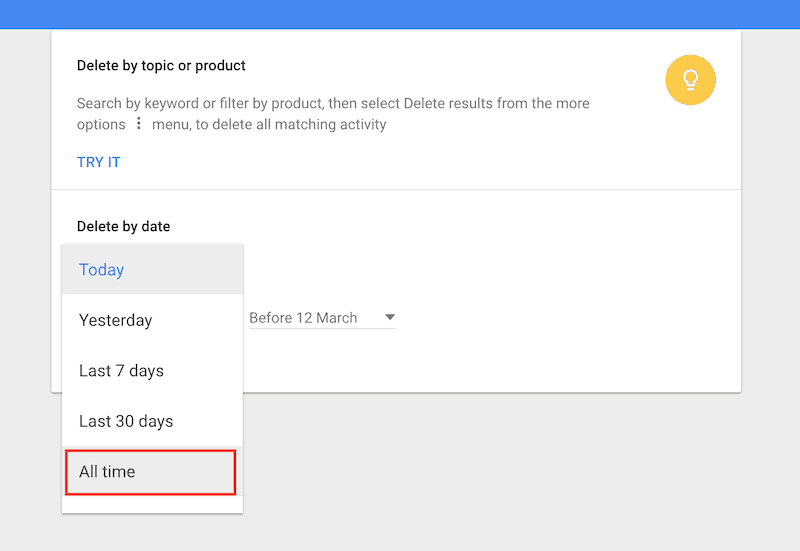 A quicker and more comprehensive way to delete your Google history is to use the “Delete by date” option instead of the “Delete by topic or product” option. Click on “Try It,” and you’ll be presented with a drop-down menu with various date ranges. You also may create a custom date range to delete. However, the most useful entry in the drop-down menu is the “All time” selection. Click “Delete,” and Google will panic again. You’ll see a card come up that wants you to verify that you really want to delete your entire history. Click “Delete” once more to complete the process. You now have a clean slate as far as Google is concerned. Of course, just because you cleaned out your history doesn’t mean that you don’t have to do anything else. Google is still going to track every move you make. 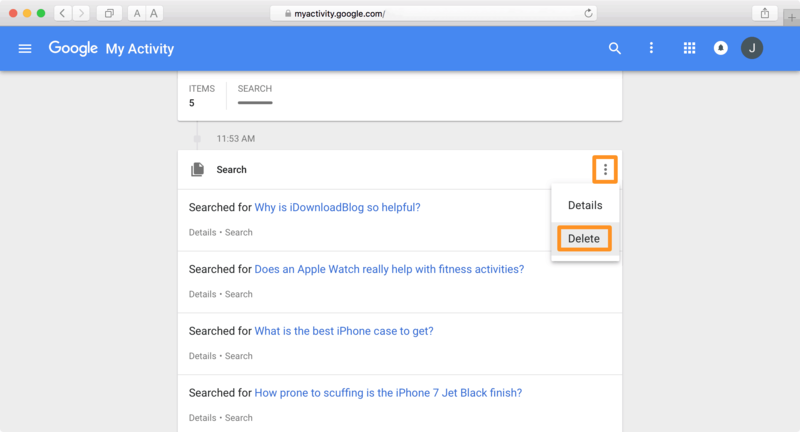 This means that you must repeat the process of deleting your Google history every few weeks or months. Each Google Activity has its own control, so you’ll have to de-select each one. 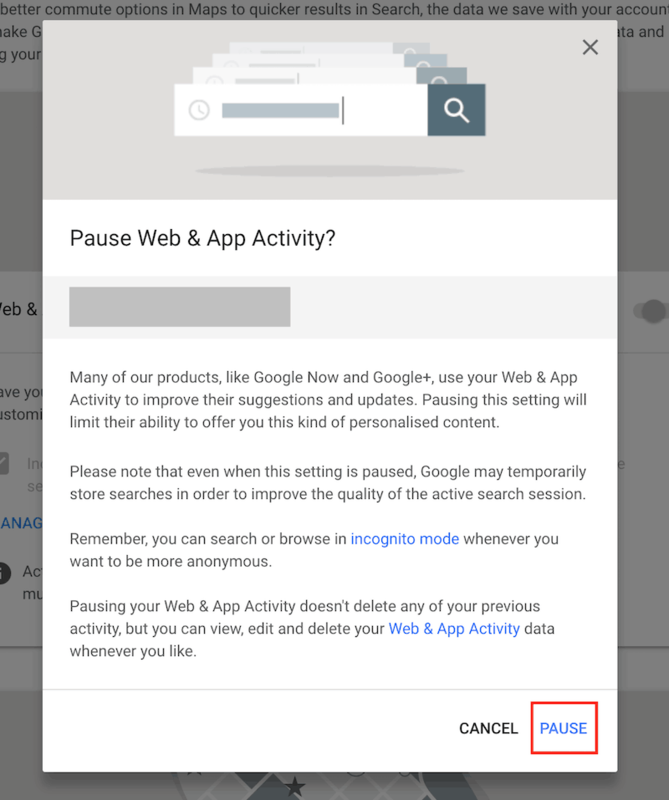 Click the “Pause” button at the bottom of the page to prevent Google from tracking you. To stop even more tracking activity, scroll down to the bottom of the next page and click on “Ads.” Once again, you’ll need to de-select all of the buttons. You’ll see a pop-up regarding ads personalization. Turn this off as well. With all of these steps completed, you can rest assured that your private data is no longer stored in Google’s vast database. Google is a giant that feeds off information for a living. Whenever you use their services, you must realize that every action is tracked, measured, and analyzed primarily to bring you advertisements. While there are certainly ways to limit the amount of information that Google can get from you, like using a completely secure browser coupled with a VPN (even a good free VPN will do), remember that you sacrifice a little bit of better experience every time you are anonymous. This topic is very subjective, but will always remain to be a question of balance between privacy and convenience. So what’s more important for you?